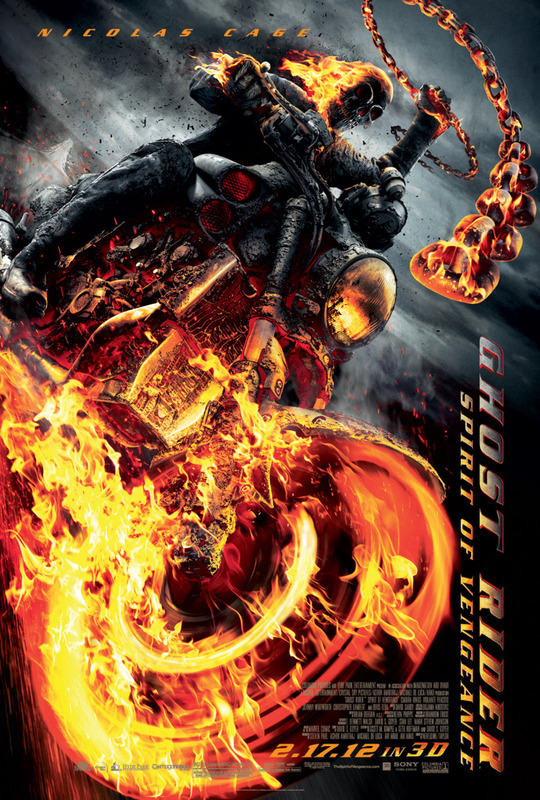 The first comic book movie of 2012 is finally out- Ghost Rider: Spirit of Vengeance (SOV)! 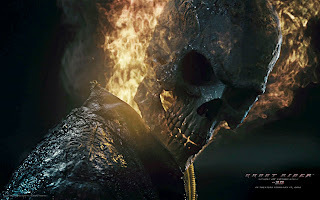 Now I know many of you guys were really hating on the first movie & Nicholas Cage as Johnny Blaze, but I don't & I also think SOV really captures the essence of the Ghost Rider (GR) character. The movie starts off with a "recap" that's basically the gist of the first movie albeit in an extremely vibrant, colorful, dynamic animation! I absolutely LOVED it. The best part is that this amazing animated imagery will continue to appear during the movie, especially when there are concepts about the GR world that need to be explained to the viewer. 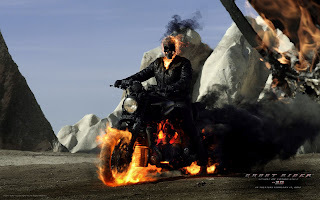 With the origin of Ghost Rider explained, the movie begins with French biker priest, Moreau (Idris Elba) riding down to the Church to find out if "the boy" is safe. This boy, Danny, happens to be of great interest to Rourke aka The Devil, the reason for which is unraveled during the course of the movie. So Danny & his Romanian mother, Nadya, (the unknown but very gorgeous, Violante Placido) are on the run from the Devil & his henchmen i.e. Carrigan (Johnny Whitworth) & his goons. And of course coming to the rescue of mother & child is Ghost Rider & Moreau. Now let's get onto the various points in the movie. Story-wise imo there was a lot more on offer this time around than with the first GR movie. The action is SUPER-fantastic! All of GR's powers are on full spotlight in this film. While the previous movie mainly only showed him using his Penance Stare, this time around you'll get to see LOADS of incredible chain action, hand-to-hand combat & victims crumbling to fiery ash & smoke! If you've played the Marvel Ultimate Alliance game you'll recognize moves like: Ravaging Flame, Fiendish Chains (see below), Chains of Retribution (spinning around with his red hot chain), Fear & of course, the Penance Stare! Another great thing here is that the true extent of his power is revealed- turning ANY vehicle he rides into a hell vehicle. 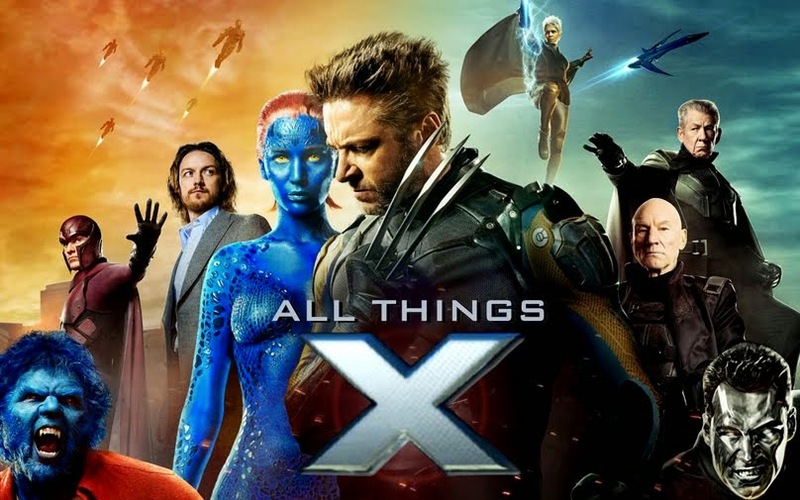 With roughly 85% of the movie being CG-enhanced, Visual Effects play a big role here- & they were simply AWESOME! The fiery skull looks waaaay more real this time. The burnt look on the skull & bike is a great idea imo, to show that he's been GR for a while now...And the fire just looks way more wickedly cool on that black skull than the plain ol' white one...All the effects are well done & look really well created. You can tell a lot of time was taken on designing things for this movie than was done on the first one. Now about the acting. Though Nic was good for the most part, there were times when he was off & it sorta made it look like you're seeing a scene from Superhero Movie 2! It's almost laughable. Especially when he's in human form & is trying to portray the madness that Blaze goes through when trying to resist the urge to turn into GR. It's just wierd. So don't say I didn't warn ya! All in all, Ghost Rider: Spirit of Vengeance is a good popcorn action flick that's not meant to be taken seriously. My advice to you is just to go for the movie with an open mind & no huge expectations & you'll be satisfied. I'd give the movie a 7/10. It certainly outdid it's predecessor imo. I haven't seen the movie yet but after reading the rerview above and on many other sites i fell that it will be a good 3d adventure I'm gonna watch it tonight , hope that i dont come out of the hall criticizing myself for watching it . That's great! Hope you enjoyed the movie...This was precisely my main aim of writing the review, cos most of those who hated the 1st movie will avoid this one like the plague. But it's actually not bad- pretty good in fact, if (as I said) you go with the mindset of watching a fun, action-packed movie in the cinema.